Harlow Shapley (November 2, 1885 – October 20 1972) was an American astronomer instrumental in organizing a campaign in academia against Immanuel Velikovsky‘s controversial book Worlds in Collision. 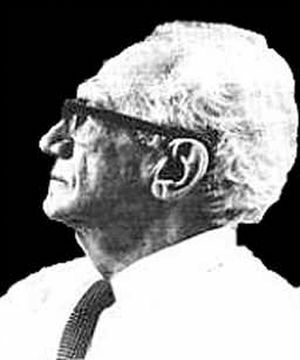 Velikovsky notes that “Shapley had not seen a single line of my manuscript, did not know a single argument or literary source I employed [and he] did not become intrigued enough to read the book about which he expressed himself so vehemently”. Letter, March 31, 1947, “Immanuel Velikovsky to Harlow Shapley” at the Velikovsky Archive. Retrieved Dec 2, 2008. Letter, January 18, 1950, “Harlow Shapley to The Macmillan Company” at the Velikovsky Archive. Retrieved Dec 2, 2008. Letter, January 24, 1950, “James Putnam to Professor Harlow Shapley” at the Velikovsky Archive. Retrieved Dec 2, 2008. Letter, January 25, 1950, “Harlow Shapley to James Putnam” at the Velikovsky Archive. Retrieved Dec 2, 2008. Letter, February 1, 1950, “George Brett (President, Macmillan Company) to Professor Harlow Shapley” at the Velikovsky Archive. Retrieved Dec 2, 2008. Letter, February 20, 1950, “Harlow Shapley to Mr. Ted Thackrey” at the Velikovsky Archive. Retrieved Dec 2, 2008. Letter, March 7, 1950, “Ted O. Thackrey to Dr. Harlow Shapley” at the Velikovsky Archive. Retrieved Dec 2, 2008. Letter, April 10, 1950, “Ted O. Thackrey to Dr. Harlow Shapley” at the Velikovsky Archive. Retrieved Dec 2, 2008. Letter, March 8, 1950, “Harlow Shapley to Mr. T. O. Thackrey” at the Velikovsky Archive. Retrieved Dec 2, 2008. Letter, June 6,1950, “Harlow Shapley to Mr. T. O. Thackrey at the Velikovsky Archive. Retrieved Dec 2, 2008. Letter, May 1, 1952, “Harlow Shapley to Dr. Robert H. Pfeiffer” at the Velikovsky Archive. Retrieved Dec 2, 2008. 1. ↑ Immanuel Velikovsky, Stargazers and Gravediggers (1983) “At Mademoiselle”, 1983, William Morrow and Company, Inc, New York, ISBN 0-688-01545-X. “I give our conversation as I reproduced it in a letter written four years later to Ted O. Thackrey of the New York Post, an acquaintance of mine.